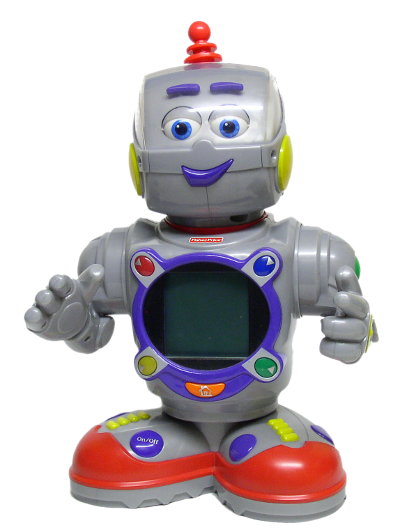 I bought this, the 3rd generation of the 2-XL robots, for my nephew when it first came out in 2002. Since there was no way that I was ever going to get it back from him, I was happy to find not only one, but two at local Thrift Stores. To my surprise, there were apparently two different versions produced. The original 2002 model was fully articulated in all of his joints - both arms, neck, waist, eyes and eyebrows. The later model, coming out in 2004 no longer moved the right arm or waist on his own - although you can position them manually. I can only assume that this was to save money on already failing sales. There were only eight expansion cartridges released - two reading, two math, two science and two languages (unfortunately there was no Italian language cartridge! ).